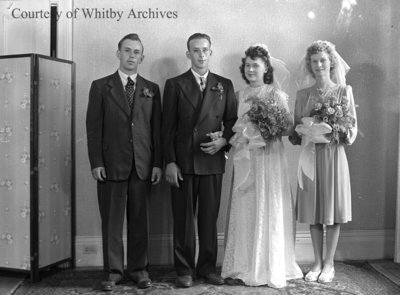 A black and white large format negative of Mr. and Mrs. Ricard and their wedding party on September 27, 1947, in Green River, Ontario. From left to right: unidentified man, Mr. Ricard, Mrs. Ricard and unidentified woman. This negative has started to degrade. Ricard Wedding Party, September 27, 1947, Marjorie Ruddy. Whitby Archives A2013_040_485.